Technological exploit and witness of historic times, conceived by Pierre Paul Riquet during the XVII century and classified a UNESCO world heritage site since 1996, the Canal du Midi links the Mediterranean Sea and Atlantic Ocean offering unique scenery, historic sites and gastronomy. 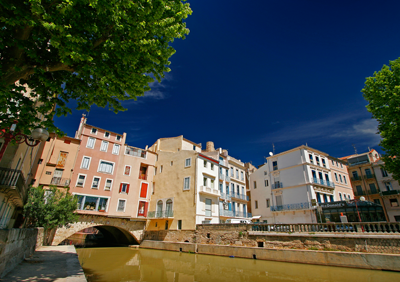 Savannah cruises between Bram and La Redorte (or reverse route) through the flowing sunflower valley of the Lauragais into the vineyards of Crobières and Minervois. 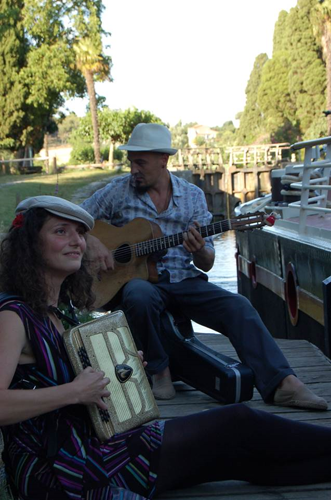 Upon your arrival at the planned meeting point, your guide will accompany you to the barge. Once settled in comfortably, A glass of champagne will be the ideal moment to meet the crew and set off on your first cruise. It’s in a most enchanting countryside mooring that you will enjoy the exclusiveness of this adventure and experience the refined diner prepared by your chef, the outstanding wines and champagnes and the joy of being on board the “Savannah” as the night falls. 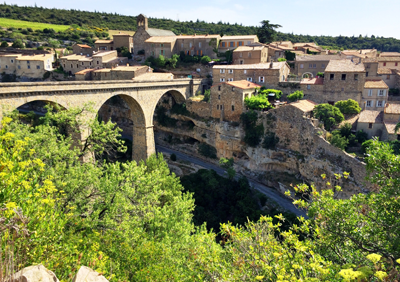 Discover Minerve, considered one of the prettiest villages in France « plus beaux villages de France », perched on a heart shaped rocky spur at the meeting point of two valleys. This village is also one of the emblematic sites of Catharism and was besieged by Simon de Montford during the Albigensian crusade. 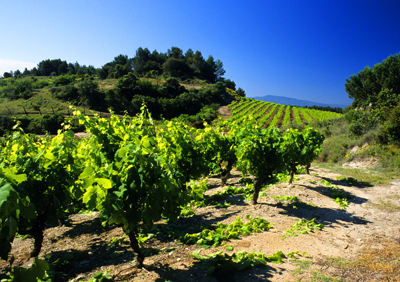 The surrounding Minervois wines have been appreciated since roman times. After a walk through this unique village and the surrounding valley, your guide will accompany you to an exceptional Minervois vineyard where you will meet the wine maker as he joins you for your first wine tasting of the week.A selection of these internationally acclaimed wines will be served during your lunch prepared on board. 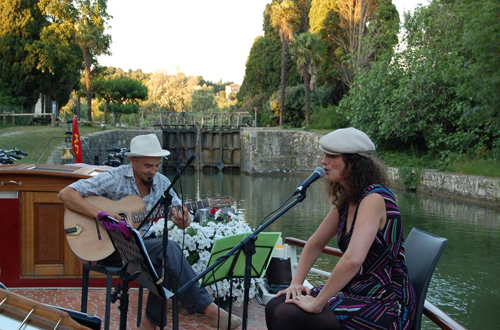 Enjoy a leisurely afternoon cruise through olive shaped locks, over aqueducts and under low stone bridges. Choose to relax on the sundeck or take the opportunity to stroll and cycle along the canal. 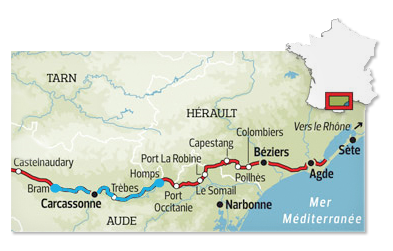 After breakfast, a morning visit to Narbonne, regional capital established in 118 BCE as a roman colonia bosts numerous historical and architectural tracks of the town’s prestidgious past. 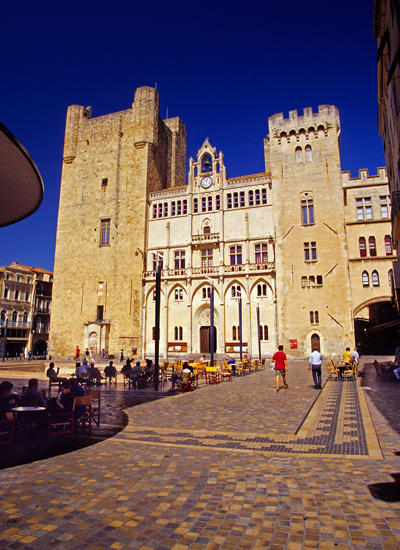 Discover the roman pavements of the Via Domitia and visit the Saint Just Cathedral and Episcopal Palace. 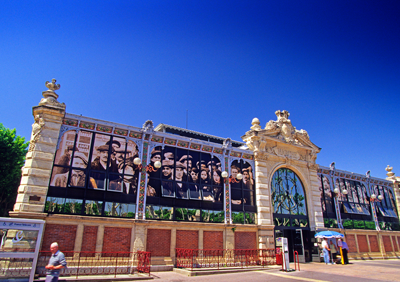 A relaxed « promenade » through the shady pedestrian streets will lead you past local boutiques to the covered marketplace. Colors, aromas and flavors! 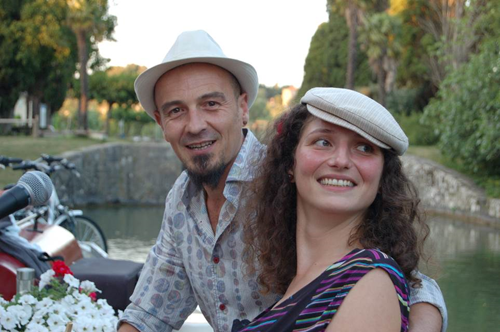 The chef will join you and together you will discover the exceptional produce of Languedoc Roussillon region and choose the fresh ingredients that will compose the gastronomic meals on board “Savannah” . 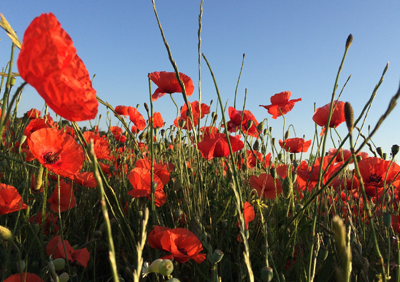 This perfect morning will be followed by lunch in the marketplace, and the afternoon dedicated to cruising the outskirts of Carcassonne towards the palm tree lined lock of Villedubert. Breakfast will be served whilst slowly cruising towards the port of Carcassonne, our lunchtime destination. 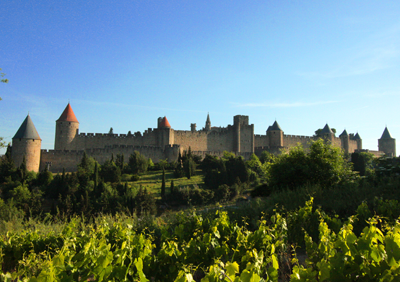 Occupied since the Neolithic and symbol of the middle age, you will visit the fortified city of Carcassonne, ascend the ramparts dating back to Gallo-Roman times, discover the medieval town, its fort, the cathedral. 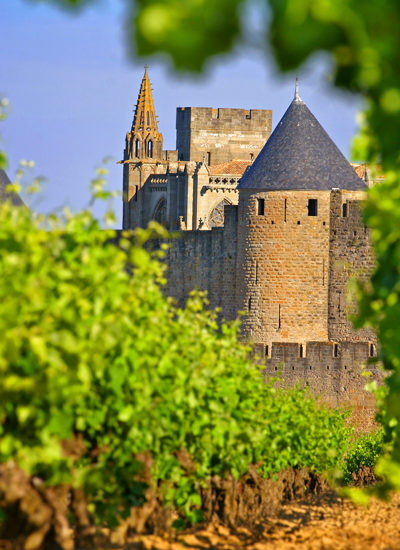 Roam and shop in the 19th century bastide of this regional capital Carcassonne will delight you. 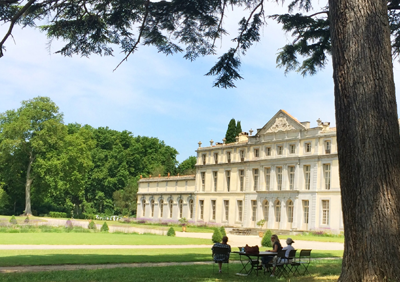 At the end of the day, your nautical stroll on Savannah will lead you towards the Lauragais and a change from the previous vineyard countryside into undulating valleys of sunflowers and wheat..
After breakfast on board, visit the Château de Pennautier. Wine tasting and lunch will be hosted in the domain and time will be spent thereafter to relax and enjoy a siesta in the castlegardens. This marvelous discovery will be followed by a cruise through the superb locks and awe inspiring views of Herminis and Lalande on your way to a new idyllic countryside mooring for the evening. 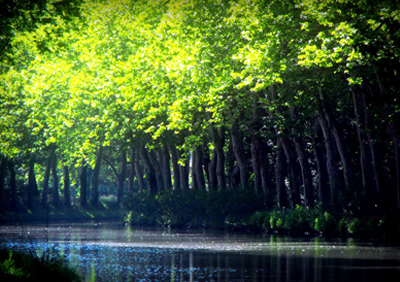 After breakfast, abandon the Canal du Midi for the foothills of the Pyreneesmountains. Mirepoix, magnificent medieval town inAriège waits for you. The market is always bustling, held under the village hall, insmall pedestrian streets and under overhanging arcades with colorful half beamed houses. You will have a foresight of the Midi Pyrénées region, architecturally and visually different from the Languedoc visited previously. 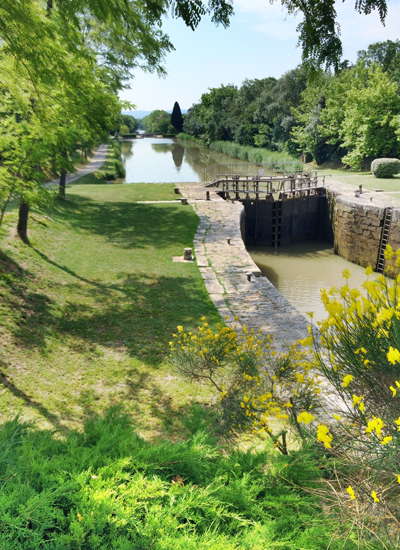 In contrast, if you prefer, our crew will help you discover the originsand museum of the Canal du midi at St Ferréol's reservoir, near Revel and it’s market. Follow the Rigole, an artificial brookbuilt to supply water from the Montagne Noir “Black mountains” to the canal.Drive through the mountains and Saissac with it’sCathar castle. 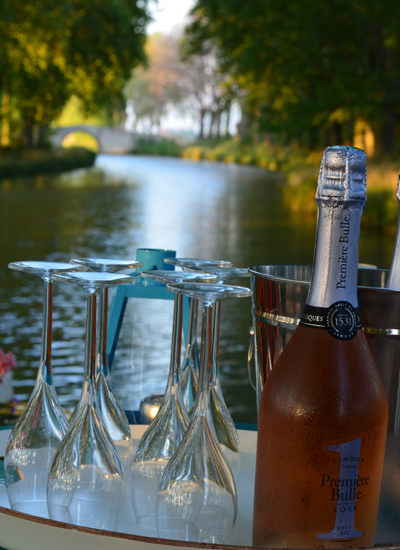 Upon your return, navigate through the Lauragais to your final destination, champagne farewell drink with the crew and your last exclusive diner on board in the Port of Bram. After breakfast, time has come to say Goodbye and safe onward Journey. Your guide will accompany you to your departure point (train station, hotel or airport). Per your interests, it will be a great pleasure to adapt the excursions. Please inform us on your desires and needs when booking.